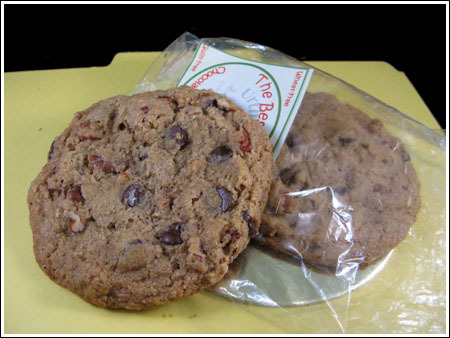 A few days ago I posted a picture of one of the wheat free vegan chocolate chip cookies I bought from Urth Caffe in Los Angeles. The wrapper reeled me in – “wheat free, dairy free, egg free, guilt free!” It sounded pretty horrible, really. But it was delicious! Part of why it was so good was the barley flour, which to me was a unique flavor. Anyway, I liked the cookie so much that I decided to try to clone it as soon as I got home. It didn’t quite happen that way because it took me 3 days to buy egg replacers, but I finally got my act together this morning and the recipe is complete. I saved the wrapper and put one of my new clones in it. Was that weird? Yes, but it shows the size. Mine may not be exactly like Urth’s, but they’re close enough to where I don’t need to keep fiddling with the recipe. Plus, these were freshly baked and maybe a tiny bit better for that reason alone. No offence to Urth, though. Their cookie stayed good for at least 2 days (I didn’t eat it all at once). So here’s how I made the cookies. This will give you 6 big ones. If you have a scale, it’s best to weigh the dry ingredients. More notes at bottom. Preheat the oven to 325 degrees F. and line a large cookie sheet with parchment paper. Beat the margarine/butter and sugar together until creamy. Beat in the vanilla, baking soda, and salt, making sure leavenings are evenly distributed. Beat in the egg replacer. 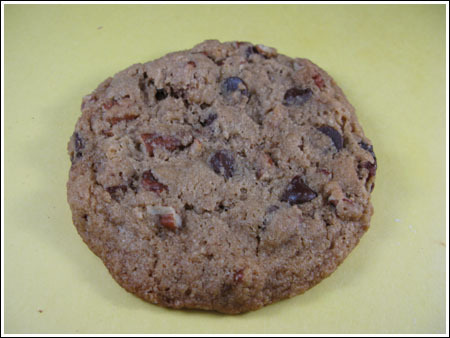 When well mixed, stir in the barley flour, oat flour, toasted pecans and chocolate chips. Shape the dough into 6 equal size balls (about 3 oz each if you have a scale), then put the balls onto the cookie sheet and pat gently to make 6 2 inch rounds – the cookies will spread as they bake. Bake for a total of 18 minutes, stopping half way to turn pan. Let cool on cookie sheet for 5 minutes, then carefully lift from pan and set on cooling rack to cool completely. *Since I made these for myself and a person who is vegan, but okay with a little whey here and there, I used an “I Can’t Believe it’s Not Butter” stick. If I were baking for someone with serious dietary restrictions or allergies, I probably would have used Earth Balance Buttery Sticks (our store was out) or Shedd’s Willow Run soybean margarine. ***I used Guittard’s new extra dark chocolate chips which seem to be vegan as I don’t see any dairy on the label. Well it’s a good thing I said “wheat free” instead of “gluten free” eh? I’m going to make these with buckwheat flour to see how they turn out! Barley contains gluten, so although it’s WHEAT free, it’s NOT GLUTEN free. Buckwheat flour is not a grain, but a grass, and therefore suitable for gluten-free cooking. Oh delicious! Great recreation. I’ve never used barley flour but now you’re intriguing me to use it. they actually do look good, the ingredients are not very appetizing, but I will believe you when you say they taste good. Yeah! They look like the real deal! I’m almost sure I can’t find egg replacers here, but I’m tempted to try them with regular egg just because ;)! I do a cookie with barley as well so I know how great these must be! I really like their color! These are fantastic! Dare I say that I like them better than a white flour cookie? I think so! Thanks. Oh man, I can’t wait to try these out. They sound so darn intriguing. Plus, they look super delicious. Great recreation, I’d say! I’ve got some barley flour in the freezer and can’t wait to try these. Mmm, these look great. Though I’m not vegan, I’d love to try making this recipe. Sue, the bag of Arrowhead Mills barley flour wasn’t too expensive. I believe it was about $3.50. I’ve never used barley flour. Was it expensive? I noticed another cook/baker who uses buckwheat flour regularly. I haven’t ever used that either. Actually I’ve never used egg replacer either. I am going to make these. They kind of follow my new eating regime. Thanks! Looks like a great cookie! Way to go!